While you folk in the northern hemisphere suffer the cold of winter, we have the opposite down here. Although it can be just as unpleasant. Yesterday was our local club run for Sunday morning coffee in Bindoon. A 100 km return drive for me. I had planned on using the '26 Chrysler. However, when the temperature topped out at 44 degrees Celsius, I became a coward and drove up there in the air conditioned modern! The Chrysler would have been OK with the temperature, but the passengers wouldn't have been! 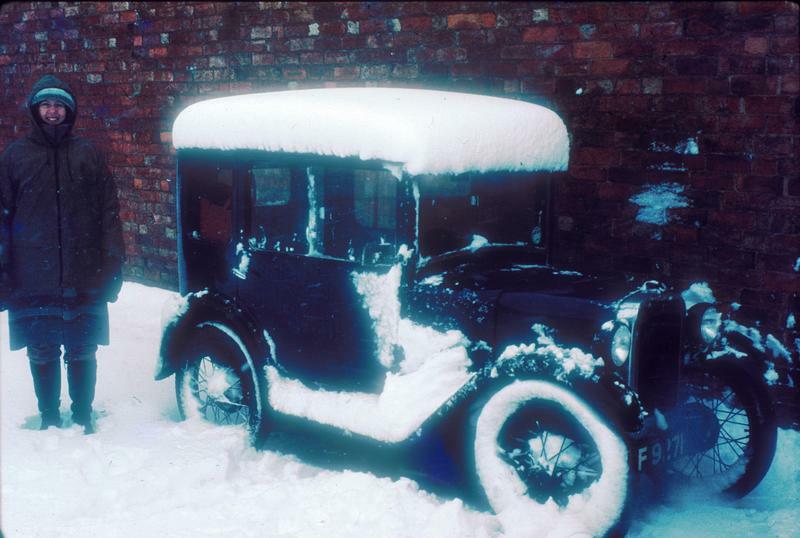 When I had my Model A Ford Tudor Sedan, I was often out and about in hot weather. Just have the windows wound down and the windscreen open just a little to get as much airflow as possible. In cold weather, on a lengthy run, even though there was no actual heater fitted, the car warmed up nicely via the four cylinder heater up front. On hot days, that engine heat added to the that from the outside air. Once I had a thermometer with me recording 121 degrees F. That was rather cosy! I still vividly recall a trip on business in a taxi in Boston (Mass.) in very hot weather. The cab didn't have aircon so I wound the window down to put my hand into the slipstream but soon retracted it as it felt just like an oven! I live in Wales, so almost every run is in inclement weather! I recall returning from a vehicle run in one of my old trucks, there was a huge storm, thunder/lightening and very heavy rain. The main reason I remember it is due to the fact the wipers completely packed up and I had to stick my hand out the window with a cloth to wipe it, we got soaked! Sometimes there just isn't a choice. On our international rallies you just have to carry on to get to the next hotel. Many's the time I have parked up under a bridge on the hard shoulder or pavement because the rain was so hard the wipers couldn't cope. Oh - and stuck in snow in July at St. Moritz! Having said it is soft southerners that have problems, I have just spent 2 and a hallf hours travelling 4.5 mls; OK it was a glazed surface after about an inch of snow, but I didn't have problems moving in 1st and 2nd on tickover so why was everybody else using bootfulls of throttle and wagging the front and rear of their vehicles all over the place? If they hadn't been there I could have done it in about half an hour, or may be less without any drama. Penman, Although we don't have much, if any, ice to deal with here, we have drivers with that same unaccountable mentality when it comes to slippery mud. I have never understood why, when it is obvious that a slow turning wheel will give traction and a over-powered fast one will just slip. I didn't have problems moving in 1st and 2nd on tickover so why was everybody else using bootfulls of throttle and wagging the front and rear of their vehicles all over the place? . Back in the mid 'seventies I had a similar experience whilst driving a Green Line coach. On two separate occasions, out of all the cars mine was the only vehicle to make it up a snow/ice covered hill by driving in the same manner, with a semi-auto transmission. 1987 classic Range Rover Vouge. Many makes & models have served as my transport since 1964, all old & some of them older than me. I remember taking my Dad back home to Portsmouth in January 1980. I had a Mk 1 Golf S, 1500cc and rubber mats, and stayed with friends on Portsdown hill that night. In the morning the car was like a block of ice and it took 30 mins to even open the door, then another 30 to de-ice the car enough to drive. I drove very cautiously, and knew we were in for it when the gritter lorry came up the hill in reverse at Sutton Scotney. It was now snowing heavily, so south of Newbury I pulled into a pub (30 miles in two hours by now) to have a coffee or tea. It was impossible to leave, the snow being over the hub caps by now, and more and more people arrived and we all had to spend the night as best we could, on chairs benches and whatever. I had taken one of the only rooms, but when a couple, the wife 8 months pregnant, arrived I relinquished it and slept on the floor in front of the fire. It took two days to get home to Leicester, but I'll always remember the wonderful full english breakfast the landlady cooked up the next morning. The pub is no more sadly, but I often called in if down that way. I had taken one of the only rooms, but when a couple, the wife 8 months pregnant, arrived I relinquished it and slept on the floor in front of the fire. It took two days to get home to Leicester. I must admit that last years long hot spell over summer did put me off using my older cars as much as I should have done. I had a number of events planned for my recent restoration, but as it's running a little warmer than I'd like, I didn't want to tempt fate. I have done quite a number of shows in wet weather. It's disappointing for everyone, especially if there's an autojumble and everything has to be covered up, but there's nothing to be done. Strange that I wouldn't usually let rain put me off, whereas I did let hot dry sunny weather put me off last year. I do recall when my Firenza was a daily driver, on more than one occasion I had to set it running to warm up while I brushed several inches of snow off the car.